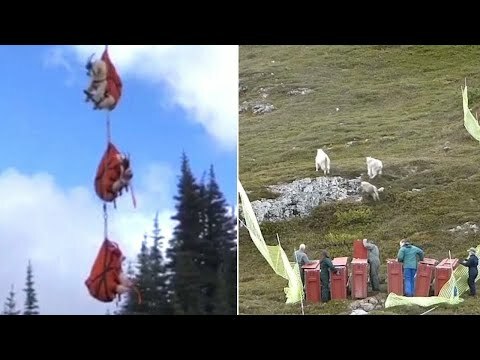 Officials in Washington State are relocating hundreds of mountain goats who roam across Olympic National Park by airlifting them out of the area. Teams used tranquilizer darts to capture the animals before they were blindfolded, placed in slings and attached to a helicopter. After landing, they were tagged and released into the wild. State officials began the process this week after plans were drawn up in June. InsideEdition.com’s Keleigh Nealon (http://twitter.com/KeleighNealon) has more.